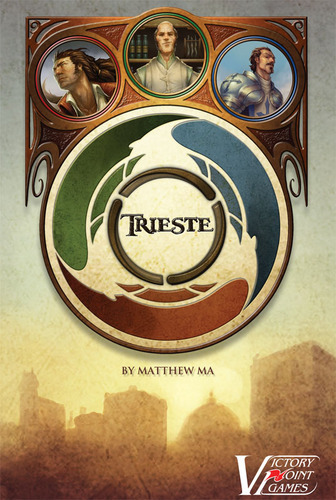 Trieste, from designer Matthew Ma, is a boxed card game where three players take on the roles of Thief, Merchant, or City Watch respectively. Each role has its own unique deck and victory conditions. Turns are played out simultaneously, with each player selecting an action without knowing those chosen by opponents. The City Watch player levies taxes on the Merchant, and patrols the streets for the Thief, looking to fill the city’s jail with ne'er-do-wells. Players in the role of the Merchant are out to cut deals and line their coffers, in a quest for untold riches. As the Thief, that player is attempting to pilfer coins from the Merchant, while earning infamy and the respect of the secretive Foxtail Gang. The coastal city of Trieste is a flurry of trade and activity, but where there's power, there are always those who will compete to grab as much of it as they can. Conflict erupts in the streets, shops, and back alleys. Only one can truly rule Trieste. Will it be you? This is a great little 3-player game. I don't mean that at all disparagingly; it is far from a simple filler! It is not often a game is designed specifically for 3 players and (for me at least) this would fill a gap in any collection. The rules are simple to pick up and without any obvious need for clarification. Yet, there is plenty of scope for tactical play and serious 'messing up' of other players plans - always a plus in my book. The 3 different win conditions seem to be balanced, but only many more plays will confirm this. All this in a game that plays inside 30 minutes - excellent!